Sunday was the day we were heading home to Limassol and the next meal on our gastronomical adventure, in the Paphos region. 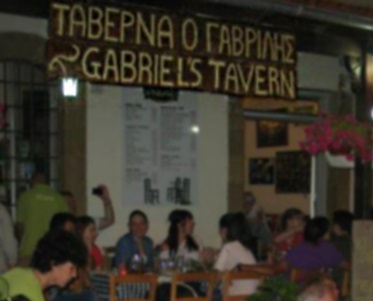 The restaurant was Gabriel’s Tavern, in Kouklia. We’ve been a couple of times before, once in August 2012 and once for Christmas Eve 2014. On both occasions, we thoroughly enjoyed our meals. Gabriel’s is in a lovely spot in the square, opposite the church and flanked by two other restaurants. There have been times when the roads into the square were closed, to allow entertainers to perform, but I understand that is not the case, at present. We sat at a corner table on the edge of the veranda, a very nice touch on the wall behind me, was the wine list and the information about the wines and their respective vineyards. We all ordered a Keo, it’s a light, refreshing beer and has a wonderful nutty flavour. In hindsight, given the temperature that day we should have ordered two to share and then ordered two more, but hindsight is 20:20. As this was mine and J’s third trip to Gabriel’s, I can say that the menu is varied and many of the dishes served are delicious. This visit we opted for appetizers and main courses. J had the mushrooms in a creamy white wine sauce, M-in-law and I had the garlic mushrooms in breadcrumbs and F-in-law had the tomato and feta cheese dish. The mushrooms in white wine sauce were delectable, J is a sweetie for sharing a little with me, the chopped mushrooms were soft but not slimy (a pet dislike of mine) and the sauce was creamy with a slight piquancy, preventing it from being too rich. M-in-law and I enjoyed our garlic mushrooms fried in breadcrumbs. Whole mushrooms, soaked in garlic butter and coated with crispy breadcrumbs. The breadcrumbs managed to completely encapsulate the mushrooms and hold the garlic inside until it was cut open. Gorgeous! F-in-law had the tomatoes and feta, which I know to be de-lish and have replicated several times at home. Large, succulent, vine tomatoes are cut into thick slices, covered with crumbled feta and sprinkled with oregano and a light drizzle of olive oil. The tomatoes are (in the most part) locally grown, juicy and tasty. With condiments on the table it is perfect for seasoning to taste. This dish is light and refreshing, ideal for days when the temperature is high. For our main courses J and his mother ordered the chicken breast, stuffed with bacon, cheese and mushrooms, and they were stuffed full. I opted for the stuffed sheftalia (pork and lamb mince formed into a sausage with a special mixture of herbs and wrapped in caul fat); it was a lot larger than I had anticipated. F-in-law opted for a simple cheeseburger. All three were served with chips and salad, with a lemon for dressing. The salad was crisp and fresh, the lemon made a lovely dressing with a slight drizzle of olive oil. The chips had a hint of the ‘french fry’ about them, but they were cooked perfectly, golden brown and crispy on the outside, and light and fluffy on the inside. As mentioned, the chicken breasts were stuffed full of bacon, cheese and mushrooms, which all stayed inside the chicken (how come it never stays inside when you try to do it at home?). The chicken remained succulent and tender, with the flavours from stuffing permeating the breast meat (another score for J who let me try a bit). The sheftalia was very large and also stuffed with bacon, cheese and mushrooms. As sheftalia is formed using pork and lamb mince the cheese had mingled throughout the meat giving a wonderful flavour and essentially allowed the bacon and mushrooms to marinade in the ‘sauce’ created. It was delicious. Sheftalia is one of those meals that can sometimes suffer from an excess of grease, however I am glad to say that this one was perfect, retaining the meat juices without the excess fat that can happen occasionally. I attribute this to the quality of the chef. Given the size of the sheftalia ‘sausage’, I hadn’t expected to finish my meal, but I did with gusto. F-in-law had ordered a cheeseburger, however the ubiquitous burger bun was absent. Instead the cheeseburger was served in pita bread. I think this is a fabulous idea and a welcome change from the bread bun. There is nothing wrong with the bread here in Cyprus and I will always sing the praises of the bakeries here. However, when the weather is hot and the appetite somewhat suppressed, filling up on a large bread bun takes away the enjoyment of a good meal and the flavour of a well-cooked burger. I know that F-in-law appreciated the substitution as well as the use of ‘real’ rather than processed cheese slices. The staff and the owner are lovely people, friendly and polite. They recognised my in-laws and came over for a chat (they are reasonably regular visitors), but otherwise didn’t hover. There was an appropriate pause between finishing the appetizers and the serving of the main courses, not too long and not too short. I’m sure this can’t be maintained at busier times, but it was a nice addition to the excellent service they provided. I would recommend Gabriel’s to anyone and I have. I would very much like to take my parents there when they visit us, but it is a significant drive from our home, in Limassol. However, anyone living or holidaying in the Paphos region should give Gabriel’s a try, probably finding a new favourite in Kouklia. This entry was posted in Articles and tagged good food, Paphos food, Paphos Restaurants by Mamie. Bookmark the permalink.